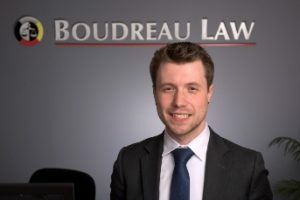 Michael is an associate with Boudreau Law. He attended law school at McGill University, where he completed a major in international human rights and development. While attending McGill’s Faculty of Law, he completed two human rights internships. The first was with the First Nations Child and Family Caring Society of Canada during the summer of 2015, through McGill’s Centre for Human Rights and Legal Pluralism. While there, he was able to help organize a portion of the closing ceremony for the Truth and Reconciliation Commission on the grounds of Rideau Hall, while also providing supporting legal research for a variety of projects. The second human rights internship occurred over the course of the 2016-2017 school year with the organization Voices-Voix. While there, he updated and contributed to the ongoing project of documenting issues around Canada that threaten the full participation of civil society within our Canadian democracy. Over the years, Michael also volunteered with the faculty’s high school outreach program known as L.E.X., and the Legal Information Clinic at McGill, among others. Prior to attending law school, Michael completed an undergraduate degree at the University of Winnipeg, where he double-majored in political science and philosophy.